I Conquered My Inbox Anxiety! For years now, my email inbox has been a source of frustration, stress, and anxiety. I receive lots of email. But I’m horrible at managing my inbox! I’ve tried all kinds of email tips, tricks and filing techniques. I’ve tried unsubscribing to unimportant subscription emails. Reduced the number of distribution lists I’m on. I’ve tried auto-rules. I’ve tried scheduling “email time” early in my work morning to keep up. I’ve even tried just dumping things in to one big folder. But nothing has seemed to work. Until now. I have found something that works for me. And believe it or not… it’s simple. So, here it is. 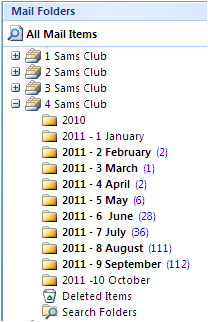 I’ve taken my personal folders and turned them in to “years”. Then I create sub-folders that are “months”. I did this both for received emails and for sent emails. Then when I’m done with my emails – I simply move them over to the proper month. It’s fast. It’s efficient. It’s easy! I told a few people about this, but they challenged me saying, “How will you ever find an archived email if you don’t file them by name, topic, project, etc.”? First, I took a good hard look at how often I actually go back and pull up or need an old email. Survey says? Very rarely. Second, I learned that most of the emails I do look for are things that have been sent to me within the last 4-6 weeks. So, that means only looking in 1-3 sub-folders max. Third, searching sub-folders is easy. I can sort by name, topic, or date. I can also use key word searches. And quite honestly, because the sub-folders are relatively small, the search doesn’t take very long to complete and I spot things quickly. This method may not be for everyone, but after one month – I am pretty happy with it! Now, there are no silver bullets when it comes to email management. I do still delete unnecessary emails, unsubscribe, limit the distributions I’m on, and use auto-rules. However, this new filing system has given me back time in my day and lowered my stress level. If you try it, let me know if it worked for you too. How do you keep your inbox clean? Listening is a critical skill. I don’t think anyone reading this post would deny it. As I watch the great leaders around me, I notice one thing that they have in common. They listen. Rarely are they the first to talk. They listen, contemplate, and then ask questions. And then, when they are ready to make a statement, those around them almost lean forward in anticipation of what is about to be said because they know that it will be important. Because the leader’s words were built upon a foundation of first listening to others. So, how do you become a better listener? The first method of course is to simply close your own mouth, which many of us often find to be a challenge. I’m the first to admit that I sometimes struggle in this area. However, when I get it right, it’s amazing what happens. I find myself listening more intently to those around me and understanding much more than I did before. The path to improved listening, however, is more of a journey than a sudden magnificent change. There are many methods, but each of them takes focus, practice, and conscious repetitious effort. This weekend, I stumbled across a TED video by Julian Treasure that talks about 5 Ways to Listen Better. So, I thought that I would share with you here to put more tools into your leader’s locker. So, what’d you think? Pretty interesting! Personally, I found the fifth exercise to be the best. However, all are great tools to enhance your ability to listen to the environment around you. And hopefully to not only enhance your ability to listen, but your enjoyment of it as well. What exercises, tools, or tips have you found to help improve your listening skill?